At the March Huntingdon faculty meeting, the proposal for a new major in Criminal Justice was approved. If you are a current student interested in this major, you may change your major or add this major in August. New students will be able to declare this major upon entrance. Information about the curriculum and the program will be posted on the website soon. See the Programs of Study page for more information. This week has been deemed Undergraduate Research Week. Fourteen Huntingdon students and three faculty from the Department of Chemistry & Biochemistry have presented or will present their original undergraduate research at two national and one regional meeting in March and April: the 257th national ACS meeting in Orlando, Fla. (March 31–April 4, 2019); the Annual ASBMB meeting in Orlando, Fla., April 7–9, 2019; and the Southern Section of the Association of Official Analytical Chemists (SS-AOAC), Buckhead, GA, April 15–18, 2019. Four first-year students (John Buford, Andrew Hines, Colby Hutson, and Ryan Sewell) will present two undergraduate research posters at the SS-AOAC. The students are a part of a first-year undergraduate research team this semester (that also includes Heidi Gilmore, Abigail Cody, and MaCayla Clements) whose work serves as a model for the Presidential Fellows Program—Huntingdon Undergraduate Science Research Team, which begins in fall 2019. “Investigation of the hyper-accumulation ability of Mammoth sunflowers using ICP-OES,” Sarah Beauchamp and Maureen Kendrick Murphy*. “Analysis of volcanic ash from Mount St. Helens and Kilauea eruptions: Comparison and contrast of elemental content by ICP-OES,” Jordan McElroy ’20, Mary-Elizabeth Whalum ’20, and Maureen Kendrick Murphy*. “What’s in Your Tattoo? Comparison of the elemental content of commercial tattoo inks with native Maori body dyes from New Zealand,” Mackenzie Smelley ’20, Seth Warren ’20, and Maureen Kendrick Murphy*. “Examination of the elemental content of coral from the Gulf of Mexico and the Great Barrier Reef,” Jordan Fleming ’20, Sidney Ison ’20, and Maureen Kendrick Murphy*. “Investigating the breakdown of cellulosic materials in environmentally benign conditions, “ C.A. Feagin (Chase) ’19, M.K.Stading, and J.K. Berch. In a first for Huntingdon researchers, the volcanic ash analysis research presentation by Jordan McElroy and Mary-Elizabeth Whalum was commended by a Councilor from the Council on Undergraduate Research (cur.org). The students and Dr. Murphy have been invited to submit this research for possible presentation at the CUR’s “Posters on the Hill” program to members of Congress in Washington, D.C., next April. The event is highly selective. Dr. Anneliese Spaeth has been appointed associate vice president for technology, a new position created in light of the increasing role technology plays across operations and academics, effective immediately. In her new role, Dr. Spaeth will manage technology strategic planning and implementation, including software and infrastructure, and supervise the Technology Support Services and PrintShop staff. Dr. Spaeth has served in the roles of chair and associate professor of mathematics; Applied Mathematics program coordinator; and director of academic technology services and project management for the past year. Her work has included the implementation of the campus learning management system, Canvas, in which she has facilitated the creation of Canvas companion courses that work in tandem with each Evening Studies course, enabling ongoing communication and information exchange between students and professors. 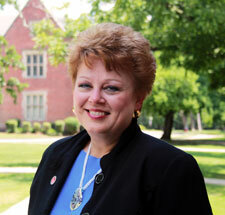 Her work has also made it possible for Huntingdon to offer online courses for summer enrollment, resulting in the largest summer enrollment in college history in 2018. She has been a member of the Huntingdon Department of Mathematics faculty since 2012, leading the adoption of the Applied Mathematics major and creating the Huntingdon robotics lab, among other initiatives. Dr. William Young, assistant professor of mathematics since 2013, has been named chair of the Department of Mathematics. Drs. Young and Spaeth earned their Ph.D. and Master of Science degrees in mathematics at Vanderbilt University. Dr. Spaeth’s undergraduate alma mater is Xavier University, while Dr. Young graduated from Purdue University. Dr. Blake Ball‘s (assistant professor of history) revised dissertation, Charlie Brown’s America, has been recommended by peer review readers for publication by Oxford University Press. The book covers American political history from the 1950s to the 1980s through the lens of Charles Schulz’s Peanuts comic strip, investigating the cartoonist’s comments on the Cold War, racial integration, religious revivalism, feminism, environmentalism, and the Vietnam War, and how readers responded to these messages. Huntingdon Greek Life has a new partner: Phi Beta Sigma Fraternity, Inc., has been invited to start a chapter on campus. The fraternity was founded at Howard University in 1914 by three African-American students with the intention of exemplifying the ideals of brotherhood, scholarship, and service. Under the motto, “Culture for Service and Service for Humanity,” the fraternity welcomes candidates who have earned a minimum cumulative grade point average of 2.5 after at least one grading period at the collegiate level; who have not been members of other fraternities; and who complete the application process and qualify for selection. Phi Beta Sigma members were on campus April 7 to meet with candidates. Their charter will be granted after the fraternity has welcomed five members, which is anticipated by spring 2020. Phi Beta Sigma joins Sigma Phi Epsilon, Sigma Nu, and Lambda Chi Alpha fraternities for Huntingdon men. Cameron Page ’22, of Mary Esther, Fla., was crowned Mr. Huntingdon 2019 at the conclusion of the pageant held Friday, April 5. He was also deemed the Fan Favorite. Mark Melchor ’20 of Madera, Calif., was honored as Second Runner-Up; John Buford ’22 of Auburn, Ala., was named First Runner-Up; and Ian Theriault ’21 of Shalimar, Fla., was named Mr. Philanthropy. Other contestants were Alex Vainstein ’20, of Montgomery; Joaquin Trigueros ’19, of Miami, Fla.; Cody Argade ’22, of Deatsville, Ala.; and Thomas Lovett ’21, of Alexander City, Ala. Congratulations to all 8 contestants, who put on a great show. Allergies: Sneezing, itchy/watery eyes, sore throat, congestion: try over-the-counter remedies such as Claritin D or Zyrtec. Colds: Runny nose, sneezing, sore throat, low-grade fever, cough (with or without mucus), fatigue: try over-the-counter remedies to alleviate symptoms and get as much rest as you can. Colds usually improve on their own within 7–10 days. Bronchitis: Fever, fatigue, cough with mucus, wheezing, trouble breathing , chest pain. Bronchitis can range from mild, which can improve on its own in 7–10 days, to severe, which can lead to more serious illness, so don’t delay in seeking treatment if your fever is higher than 101 degrees, you have difficulty breathing or chest pain, and your cough is accompanied by discolored mucus or blood. Make an appointment with Student Health Services or visit Our Med Urgent Care at 9188 Eastchase Parkway, Chantilly Corners. Pneumonia: Fever, fatigue, cough with mucus, wheezing, trouble breathing, chest pain, shaking or chills, nausea/vomiting/diarrhea: seek treatment immediately, especially if your fever is higher than 101 degrees, you have difficulty breathing or chest pain, and your cough is accompanied by discolored mucus or blood. Visit Our Med Urgent Care at 9188 Eastchase Parkway, Chantilly Corners. Be aware that not everyone’s symptoms follow the norm. Follow your instincts. The Office of Student Health Services is open in the training room on the Cloverdale Campus, M–F, 8:00–11:00 a.m. and 1:00–3:30 p.m. To make an appointment, email studenthealth@hawks.huntingdon.edu. Two big concerts will mean the magic of music lights our way into the final days of classes. Tuesday, April 16, the Concert Choir will present their Spring Concert at 6:30 p.m. in Ligon Chapel. Huntingdon Winds and Huntingdon Jazz will present their annual outdoor Pops on the Green concert at 6:00 p.m., Tuesday, April 23. For the latter, blankets, picnics, and lawn chairs are welcome (unless we move to the rain location: Ligon Chapel). Summer housing (May 22–August 8) is available at a cost of $2400 (split among occupants of the house), with priority going to those who are taking summer classes and/or working on campus. Summer residents must be registered for fall 2019 classes. Learn more and/or apply. The Montgomery County Commission invites applications for the 2019 Montgomery County Student Apprenticeship Program, June 3–July 26, 2019. Read more at www.mc-ala.org. Applications are due by April 19, 2019. ProQuest will perform maintenance on Ebook Central, Saturday, April 20, 11:00 a.m. to 1:00 p.m. CDT. Faculty, Staff, Students, check your email for a message from Hunter Traw and remember to remove and replace AVG Business Edition software according to the instructions provided to protect your operating system on each Huntingdon computer. The Freshman Leadership Initiative is holding a donation drive for toiletry items and bottled water to benefit victims of the March 2019 Lee County tornadoes. Please deliver items to Flowers Hall, Room 218A. Judicial Board Applications are due April 12; interviews April 15–19. NewSouth Books’ Clifford and Virginia Durr Lecture Series will feature author Richard Gergel, speaking on his book, Unexplained Courage: the Blinding of Sgt. Isaac Woodward and the Awakening of President Harry S. Truman and Judge J. Waties Waring, Saturday, April 13, 2019, at 6:00 p.m., Dexter Avenue King Memorial Baptist Church. In its starred review of the book, Publishers Weekly says, “In this enlightening study, judge and historian Gergel illuminates the far-reaching effects of an individual act of cruelty . . . This is an important work on the prehistory of the civil rights struggle and an insightful account of how a single incident can inspire massive social and political changes.” The Durr Lecture is free and open to the public and will be followed by a book signing. Peter Brown, children’s book author, illustrator, New York Times bestseller, and Caldecott Honor winner, Thursday, April 11, 3:30–5:30 p.m.
Ibram X. Kendli, National Book Award Nonfiction winner, and Carol Anderson, National Book Award Longlister, discussing how the power of art can inform and transform cultural narratives, Wednesday, April 17, 6:30 p.m. The Old Cloverdale Association invites the Huntingdon family to their 5th Annual May Festival, Sunday, April 28, beginning with a bike and wagon-decorating at the Community Garden at 2:30 p.m., followed by a parade beginning at the garden and ending at College Street Park. During the festival, College Street Park will be renamed Mary Ann Neeley Park in memory of the Huntingdon Class of 1954 alumna who was Montgomery’s most prominent historian. Mary Ann died last year. Entertainment will be provided by Celtic harpist Sophia Petropoulos Monday, and festivities will include a Maypole and procession of royals (yet to be named). The Bell Road YMCA will offer lifeguard certification classes April 29–May 10, M, T, Th, F, 5–8:30p; the cost is $200.00 for members, $250 for non-members. Huntingdon Jazz performed for the Tallassee JazzFest last week, joining jazz ensembles from Auburn University, various high schools, and the 313th Army Band. Laural Anthony ’17 and Jon Harrelson ’17 were married March 30, 2019. Nicole Weldon Auvil ’08 and her husband welcomed their first child, son Jack, March 21. Huntingdon welcomes Johnathan Brown, a new member of the Housekeeping staff. Dr. Jim Conely, adjunct instructor of music (piano and organ), has signed his seventh contract this academic year with Lorenz Publishers, who will publish “Celebrating the First Nowell,” an original setting for organ. Blake Denton, former assistant in the archives office who is a student in the Library & Information Science graduate program at UA, received the EBSCO Award for Research Excellence from the College, University & Special Libraries Division of the Alabama Library Association for his literature review of partnerships between academic libraries and athletics programs. Jagger Eastman ’15 and his wife, Anne, welcomed their first child, daughter Elizabeth Jean, April 4, 2019. Madison Fitzwater ’18 and Jon Colten Stanaland ’18 have announced their engagement. Julianna Grace Griffin arrived April 2, 2019, the future Hawk of proud parents Sam (’11) and Morgan Senn Griffin ’13. Drew (’11) and Christian Vick Harrell ’12 welcomed their first child, daughter Elizabeth Anne, April 5, 2019. Samantha Davis Hill ’12 and her husband, Chris, welcomed son Levi Cole Hill, April 2, 2019. Michael Johnson, who has coached defensive backs for Huntingdon since 2016, has joined the coaching staff at Valdosta State University under head coach Gary Goff. Christopher Knight ’10 and his wife, Melissa, welcomed their first daughter, Ann Douglas, August 21, 2018. Chris is a controller/CPA with 68 Ventures in Fairhope, Ala.
Drew Mathers ’20 picked up his third collegiate win, leading the Hawks golf team, ranked second in the nation, to their third win this season April 2 with a victory at the Wynlakes Intercollegiate Tournament. Henry Gee ’19 and Carson Whitton ‘22 tied for second individually. Chandler McDougal ’22 has been selected for a missional internship with the Quad-W Foundation in Birmingham this summer. He will work with socioeconomically disadvantaged populations. Carden Mellown ’20 was named USA South Pitcher of the Week March 25 for his performance in the Hawks’ 16-2 win over Methodist. Matt Murphy ’19 has been selected as USA South Lacrosse Defensive Player of the Week in recognition of 15 saves on 22 shot attempts and 3 ground balls in the Hawks’ contest against Pfeiffer last week. Gary Nelson ’09, athletic director and head varsity football coach for the Montgomery Academy, joined Dr. Derek Woessner of Southern Orthopedic Surgeons in presenting “Get Your Head in the Game: Understanding the Basics of Brain Safety in Sports,” for the Academy’s MA for Montgomery lecture series, April 2, in which he spoke on improvements in coaching techniques, awareness, and equipment. Kathleen Penney ’15, director of student activities, has been accepted to the doctoral program in higher education administration at the University of Alabama. She will begin in the fall, concurrent with her work at Huntingdon. Lorraine Porath ’17, an electroplating assistant and chemical technician for Gerhardi Kunststofftechnick GmbH in Montgomery, has announced her engagement to Jonathan Collett. Dr. Jared Rehm, assistant professor of kinesiology and biomechanics, has been selected by the National Institute on Disability, Independent Living, and Rehabilitation Research to serve as a reviewer for their Field Initiated Program Grant Competition. He is also a member of an adult Division III wheelchair basketball team made up of athletes from the Montgomery and Auburn areas. The team was one of 16 that qualified for the National Wheelchair Basketball Tournament in Chicago over the weekend, entering ranked at #6 in the nation, AND WON THE NATIONAL CHAMPIONSHIP! Catherine Reinehr ’05 has announced her engagement to John Fell. Stephen Shephard ’19 was named USA South Golfer of the Week, after winning the the Jekyll Island Invitational Tournament, March 15–17, 2019. It was his first win of the season and the third of his collegiate career. Brett Steele ’92 became the chief legal officer for Smith Douglas Homes in July 2018, one of the 50 largest builders in the United States. Prior to his current role, he served as chief legal officer for Habitat for Humanity of Atlanta. Dr. Jack Vibbert ’08 has been named a chief resident at St. Vincent’s East Family Medicine Residency in Dothan, Ala.
Courtney Woodman ’15 and her husband, Allen, welcomed son Drake Finley James Woodman, March 22, 2019. She works for Community Country Day School in Erie, Pa.
Our thoughts and prayers are with the loved ones of Sara Simpkins Crawford ’56, who passed away March 23, 2019, in Destin, Florida. Sara was preceded in death by her husband, Bob Crawford ’60. Send your news to news@hawks.huntingdon.edu.